Everyone knows that spending time outdoors is better for you than vegging out on the couch. Kids and adults who spend more time outside see benefits to both their physical and mental health. With spring right around the corner, there’s no reason to be cooped up in the gym either. Here are four great ways you can join in on the outdoor fitness fun with new twists on outdoor workout spaces. 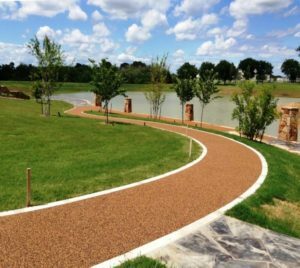 We’ll also take a look at some of the park/recreation safety surfacing products that are used in these environments to make them safer, more attractive and more fun. Once found only in military boot camp, the obstacle course now plays the starring role in the TV show Ninja Warrior and is the inspiration behind Tough Mudder, a series of muddy obstacle races inspired by British Special Forces training. These are tests of strength, endurance and—in some cases—smarts as participants look to find the best way over walls, up rope ladders and through mucky pits. It’s an aerobic workout like none other, and the more intense courses take endurance training to master. Although these areas may be modeled after military courses, they are publicly accessible and suit a wide range of ages. Obstacle courses are a fun way to get kids and the rest of the family moving. Challenge courses for children might include foam-covered hurdles and plastic trapeze rings. Participants can time how long it takes to get through a course, adding a dimension of competiveness and social interaction. Many parks departments around the country are hosting organized “challenge course” programs that promote team-building and cooperation, while obstacle course races like the Warrior Dash and Tough Mudder are true athletic tests of stamina and fortitude. If you’re building an obstacle course, you might want to consider using a rubber surfacing product like No Fault Safety Surface. It is a combination of EPDM/TPV rubber granules and a cushion layer of shredded recycled rubber. It is manufactured on-site and poured in place, providing a seamless, shock-absorbing surface. No Fault rubber safety surfacing products can incorporate creative designs, patterns and graphics that are limited only to your imagination. In 2018, the public park isn’t just for slides and merry-go-rounds. Now, kids and adults can get physically fit with a visit to their local park or public green space. Some parks are even adopting the term “outdoor fitness park” to describe what they offer. Best of all, there’s no membership fee, unlike the local gym. These parks provide exercise equipment strategically placed along jogging paths, letting users work on muscle tone, flexibility, and cardio training. Outdoor gyms are an investment in healthier lifestyles while building better parks and stronger communities. 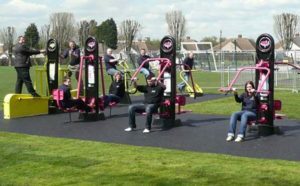 Free outdoor gyms for teens and adults have been cropping up in public parks areas, residential developments and business complexes in the last few years. Sometimes called “adult playgrounds,” these fitness zones have a lot more to offer than a set of chin-up bars or two. The best fitness zones in large metropolitan areas have equipment to accommodate workouts of different types: strength training, cardio-vascular (aerobics) and flexibility/stretching. They incorporate ADA accessible equipment to make the zone inclusive for all. All equipment is sturdy and can withstand all weather conditions. Combined with nearby jogging trails, tennis courts or basketball courts, fitness zones makes the outdoor fitness experience complete for everyone. You don’t have to settle for a treadmill to get your run on. Head for the happy trails of the great outdoors. In some cities, these trails feature exercise stations with things like traverse rings, pull up bars, and climbing walls, so users can easily get in a whole body workout. 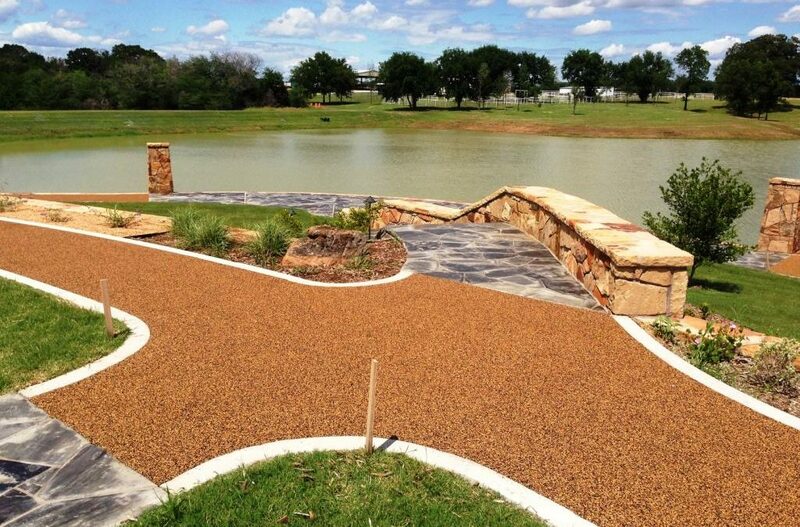 No Fault Safety Surface was installed in Bonham, Texas. This kind of a jogging/walking trail is perfect for CrossFit or Public Fitness Zones. Public fitness zones can be great for CrossFit workouts, which incorporate interval training, weightlifting and more. There is probably already a trailside CrossFit group or outdoor boot camp near you. These social workouts are extremely fun and include drills, bodyweight exercises, and endurance training. So if you’re looking for community spirit and the kind of motivation that comes in a group workout outdoors, think about getting in the zone! Ever been to a 7 a.m. dance party? Generally speaking, the club scene is the antithesis of a healthy workout. But this fitness trend means getting together with friends for high-energy dance moves to a DJ’s beats, and you’re more likely to have a smoothie or kombucha in one hand than a cocktail. Whether they’re happening in the great outdoors (the park is a great place to watch the sun rise) or in an actual music venue, an early-morning rave might take some getting used to. But for a lot of young adults, electronic music and stimulating lights are a better way to start the day than high-cal muffins and caramel lattes. While early-morning aerobics, Pilates and spin classes are often accompanied by up-tempo music, these sober dance parties take place in parks or large venues that recreate the look and feel of a noisy nightclub. Dancers enjoy the social aspect that comes with clubbing. They come garbed in the typical yoga pants and gym clothes, or they may choose something a little more exciting. This is definitely more Lady Gaga than Jane Fonda. Sessions are often led by professional dancers. A company called Daybreaker has hosted two-hour morning dance parties (called “Awakenings”) in cities including New York, Los Angeles, San Francisco and Atlanta. 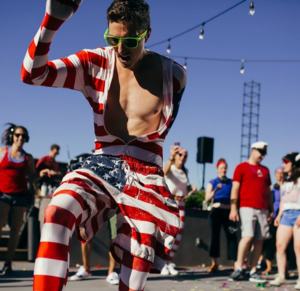 A competitor called Morning Gloryville has been doing the same thing on an international scale. “Real” golf is downright boring compared to the giant dinosaurs, windmills, arch bridges, and loop-the-loops you find in miniature golf, or “putt-putt” golf. In 2017 American mini golf officially turns 100 years old, since the first course in the States was created in North Carolina in 1916. Its popularity over ensuing decades can be chalked up to how family-friendly and fun the game is, though there is an element of serious competition as well. Indeed, The World MiniGolf Sports Federation recently joined the General Association of the International Sports Federation, meaning it could eventually become an Olympic event! So what qualifies a game of mini golf as a fitness trend? It seems that mini golf has gotten big in Europe in recent years, and it has even spread as far away as China. New courses are appearing all the time, and the layouts are getting more and more creative, with themes and hazards never before imagined becoming more common. 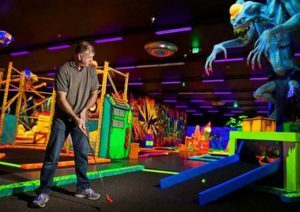 For example, Portland’s Glowing Greens boasts a glow-in-the-dark mini-golf adventure under black lights and creepy skeleton sculptures. And Molten Mountain in South Carolina is a grueling 36-hole course inside an “active” volcano (well, an air-conditioned volcano that “erupts” every half hour). Ok, but what about fitness? It turns out miniature golf isn’t a bad way to get cardiovascular exercise, and you can burn around 300 calories during a game of nine holes. Players of all ages will develop hand-eye coordination as walking and putting works out various muscles in their body. Besides, any chance to spend some time in the fresh air with friends is going to have a relaxing effect on your body and mind.